We’ve made some progress since then, but we still likely lose hundreds of thousands of votes every election year due to poor ballot design and instructions. In 2008 and 2010 alone, almost half a million people did not have their votes counted due to mistakes filling out the ballot. 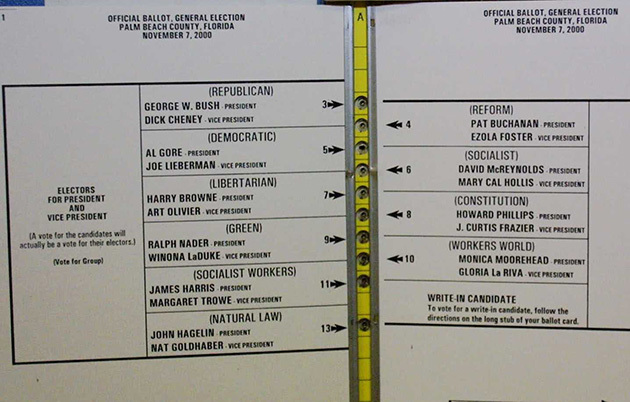 Bad ballot design also contributes to long lines on election day. And the effects are not the same for all people: the disenfranchised are disproportionately poor, minority, elderly and disabled. In the predominantly African American city of East St. Louis, the race for United States senator in 2008 was missing a header that specified the type or level of government (Federal, Congressional, Legislative, etc). Almost 10 percent of East St. Louis voters did not have their vote counted for U.S. Senate, compared to the state average of 4.4 percent. Merely adding a header could have solved the problem. 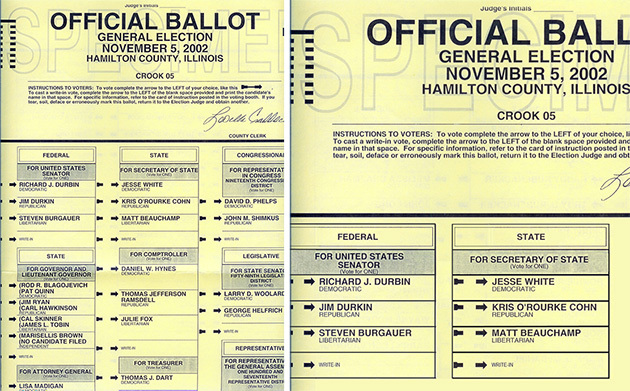 Below you can see the original ballot and the Brennan Center redesign. Many mistakes can be avoided with tiny tweaks. Designer Marcia Lausen, who directs the School of Design at the University of Illinois at Chicago, wrote a whole book about how democracy can be improved with design. She even tackles the infamous butterfly ballot. 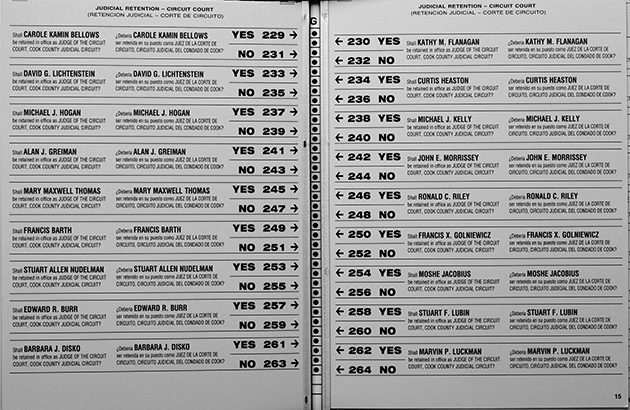 The 2000 Chicago Cook County judicial retention ballot crammed 73 candidates into 10 pages of a butterfly layout punch card ballot, with punch holes packed much more tightly together than in previous elections. 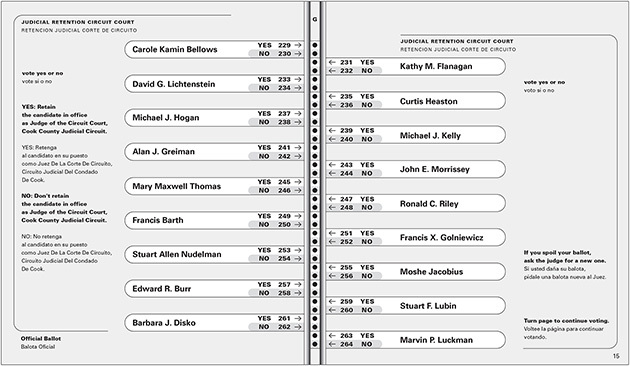 As in Palm Beach, Yes/No votes for the candidates on the left page were confusingly interlaced with Yes/No votes for the right page. 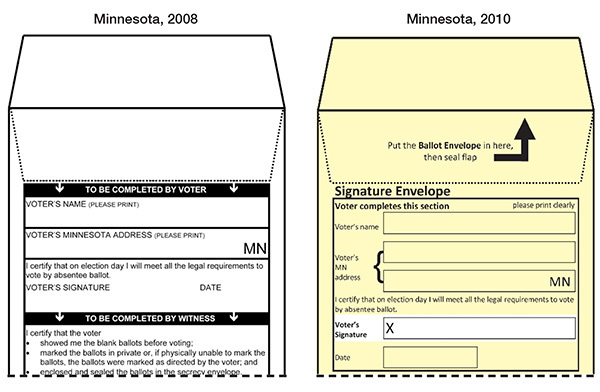 Minnesota’s mailing envelope is a good example of how designers can solve design problems well before any election actually happens — by testing those ballots beforehand. Bad instructions are a design problem, too. 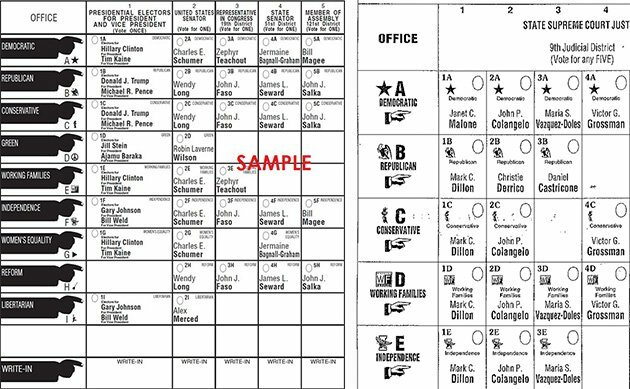 Designers have already put together guidelines for making better ballots. For the designers, these recommendations may seem obvious. But election officials — the ones responsible for laying out a ballot — are not designers. Sometimes, reality thwarts good design. That’s because ballots are as complicated as the elections they represent. Elections in the U.S. are determined at the local level, and so each ballot must be uniquely crafted to its own jurisdiction. Ballots must combine federal, state, and local contests, display measures and propositions, and sometime require voters to express their choices in various formats — for example ranking their choices versus selecting one candidate for the job. “There will always be special circumstances that present new problems for ballot design,” said David Kimball, a political science professor at the University of Missouri-St. Louis who has written extensively on voting behavior and ballot design. To make matters worse, bad design is written right into the law. For example, numerous jurisdictions require that candidate names and titles be written in capital letters. This goes against huge amounts of evidence that lowercase letters are easier to read. Other requirements like setting a specific font size, making sections bold or center-aligning headers make it next to impossible to follow all the design best practices. In design, everything matters — even the order of the candidate names. Some design problems are not as obvious as a pointing finger. Take something as simple as the order of the candidates’ names. 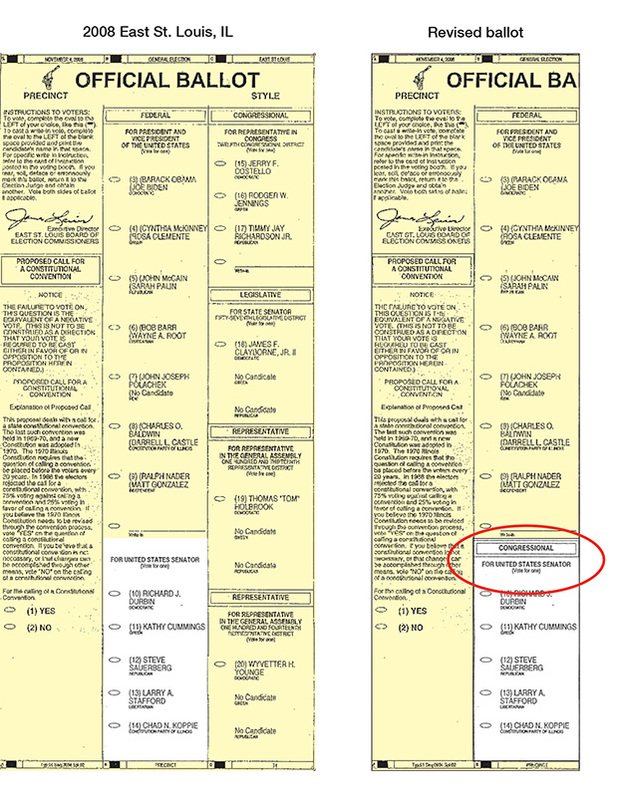 There is a well known advantage for being listed first on the ballot. The “primacy effect” can significantly sway elections, especially in smaller races not widely covered in the media where there is no incumbent. One study of the 1998 Democratic primary in New York found that in seven races the advantage from being listed first was bigger than the margin of victory. In other words, if the runner-up candidates in those races had been listed first on the ballot, they likely would have won. The future will bring new design challenges… but also new ways to make voting more accessible. As more and more states adopt absentee and vote-by-mail systems, they make voting more accessible and convenient — but they also introduce new ways of making mistakes. And those errors are only caught after the ballot has been mailed in, too late to change. A polling place acts as a fail-safe, giving you the opportunity to ask a poll worker for help or letting you fill out a new ballot if yours gets rejected by the voting machine. But on an absentee ballot, if you made a mistake and your vote isn’t counted, you’ll never know. The Anywhere Ballot is another open-source project that’s designed to create a better voting experience for everyone — including voters with low literacy or mild cognitive issues. Their digital ballot template, which came out of extensive user testing and follows all the current ballot design best practices, lets anyone use their own electronic device to mark a ballot. But of course, the design problems that plague ballots affect all aspects of the voting process. Voter registration materials, mailed voter guides and education booklets, election department websites and online instructions, poll worker materials — all of these have problems that can be improved with better design.